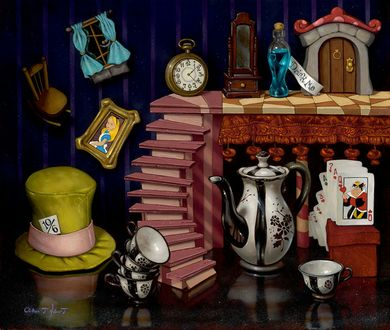 Clinton Hobart Hand-Embellished Limited Edition Canvas Giclee:"Things from Wonderland"
Edition: Artist Signed and Numbered Limited Edition of 195 with COA. Medium: Hand-Embellished Limited Edition Canvas Giclee. From the Artist: "The story behind many of my paintings is that the objects are finished with their performance and are taking a bow, which is why they are lined up on stage. I even go so far as to create personalities for them, a happy eggplant, or a sour apple, and I think of that while I am painting. Even the music that is playing in the background needs to fit the scene. Whether I am working on a Disney painting and listening to the soundtrack of whichever scene I am working, a wave with some beach music or a New Orleans mask and listening to some Jazz, the music must fit the mood of the painting."